The idea for this post came from Mark Bittman, a culinary hero of mine. He has a recipe for a whole grain panzanella in his The Food Matters Cookbook, but I wasn’t crazy about his preparation. He calls for the toasted bread to be soaked in water, a step that didn’t appeal to me. 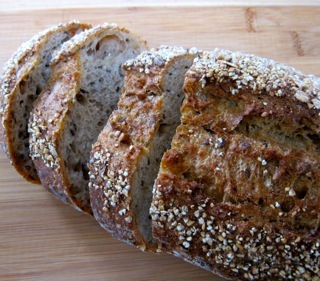 I wanted to use a beautiful whole grain loaf of bread I had picked up at our neighborhood Farmers Market a few days ago. The bread was just beginning to dry a bit and was a perfect consistency for my salad. I added some shards of Parmesan and toasted pine nuts to include a little protein, keeping with the Italian theme. TIP: Add the basil, Parmesan and toasted nuts just before serving. 1. Using a large skillet, heat the oil. Add the bread cubes and toast, stirring frequently, until browned on all sides. Set aside. 2. In a large bowl, mix together the peppers, cucumber, tomatoes and red onion. Set aside. 3. In a small, deep bowl, whisk together the vinegar and mustard. Add salt and pepper, if desired. Whisk in the olive oil. 4. Add the bread cubes to the vegetables and toss with the vinaigrette. Allow the salad the sit on the counter while you toast the pine nuts. 5. Roll the basil leaves into a cigar and slice thinly. 6. Add the toasted nuts, shards of Parmesan and fresh basil. Toss and serve. I love anything that starts with fabulous bread, then you make it into amazing croutons. Yum. My mouth is watering. Thanks, Elizabeth, but I have no idea why my photos are blurring when I post them here – any thoughts? Thank you, Greg your week of summer salads is inspiring. I love panzanella and agree with you about not soaking the bread. This is a great recipe, Liz! 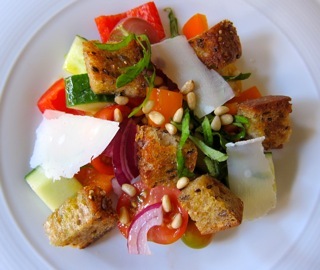 Panzanella is one of my favorite dishes, love it! Nice addition of parmesan and pine nuts! Yum! Mark Bittman is also my culinary hero and panzanella is one of my favorites – cannot wait to try this! His cookbook is terrific and I plan to turn to it for inspiration on a regular basis. Thanks, Steve, looking forward to what fall will bring in terms of inspiration from your kitchen. Hope you escaped the worst of the storm.